Feel confident using Excel in the workplace. Be able to create and navigate Excel spreadsheets. Be able to create tables, charts, pivot tables and more. Use all of the most common formulas and functions. Use keyboard shortcuts and productivity hacks to get more done faster. While I can’t make promises, my goal is to help you get the raise, promotion, or new job that you deserve. Welcome to my BIGGEST, most complete, Microsoft Excel course ever! Excel is one of the most important skills in today’s job market. Having a solid working knowledge of Excel can improve your job performance, help you qualify for raises and promotions, or even help you land that new job that you deserve. If you need to know Excel, you’re in the right place. This course walks you through Excel from the very basics of opening Excel all the way to advanced Excel skills used by the pros, like pivot tables and macros. My goal with this course is to give you the skills you need to get that raise, promotion, or new job you deserve. This course was created using Excel 2016, but it is good for versions 2013 and 2010 as well. It was created for use with a PC (personal computer). Mac (Macintosh) users can still benefit from this course, but the course doesn’t cover Mac-specific keyboard shortcuts and interface. We’ll start at the very beginning, with opening and saving a worksheet in Excel. I’ll show you what all the tools do and walk you through each Excel skill that you need to know. I’ll show you how to enter and format your data and how to create charts, tables and pivot tables so you can organize and analyze your data. I’ll teach you amazing keyboard shortcuts to make your work faster and more productive. You’ll learn how to record macros so you can do a whole series of actions with the just click of a button. We’ll keep going until you’re a pro at Excel. When you finish this course, you’ll know more than most people who use Excel at their job every day. The course comes with a certificate of completion, a full 30-day money back guarantee, and I’m always available to answer questions or share additional resources if you get stuck. 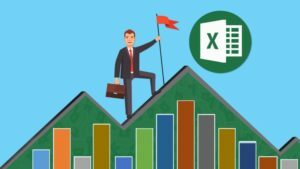 Thanks for checking out my Biggest Excel Course to date. Anyone who wants or needs to learn Microsoft Excel for their work. Designed for beginners who are brand new to Excel (also suitable for intermediate Excel users who want to improve).